As California’s #1 Retail Consumer Electronics Custom Installation & Smart Home Integration company for the 18th year in a row, and with locations all around Los Angeles for the past 30+ years, Video & Audio Center has become the preferred stop for studio executives, musicians, singers, producers, actors, actresses, directors, etc. ; nearly all phases of the entertainment industry [including legendary private shopping excursions for a dynamic performer with a shinning white glove] have walked through our doors or invited us into their homes to design and install custom home theaters. This has given us a rather unique relationship with the people who create the world's entertainment content. In fact, in 2017 Video & Audio Center was extremely honored to receive the inaugural 20th Century Fox Innovation Award for “being a pioneer in presenting new digital technologies to the consumer” — and we feel this has given us a unique perspective in the industry as well. More and more we are seeing far-sighted companies, such as LG, also recognize the strong ties between content producers and content distributors, and nowhere is that recognition more apparent than in LG’s latest “B&Binge” contest promotion. The LG ‘B&Binge’ contest taps into a unique breed of TV watcher born in the streaming era, the “Serious Watcher,” and builds on the success of last year’s inaugural Serious Watchers campaign where LG gave fans an experience of a lifetime through surprise deliveries of LG OLED TVs by beloved Netflix Original series characters. The LG ‘B&Binge’ settings and experiences will be outfitted with Easter eggs (hidden show references) and memorabilia to authentically bring each show to life for the most serious watchers. Arrested Development: Live like a Bluth aboard a yacht inspired by the Lucille, the Bluth’s infamous yacht. Whereas Gob previously sunk the Lucille as part of one of his “illusions,” this yacht is above water and safely anchored at the Marina in Los Angeles. Never nudes welcome. The Crown: Relive the royal drama from a palace in Yorkshire, England fit for a Queen or King. Royals know no needs and neither shall you; a butler will be there to attend to your needs. There will be royal garb fittings, royal etiquette boot camp, and afternoon tea shall be served promptly at 3 o’clock. Mystery Binge: This final location will involve a full sensory experience and is not for the faint of heart. Located in the depths of New England, winners will leave questioning if only seeing is believing. 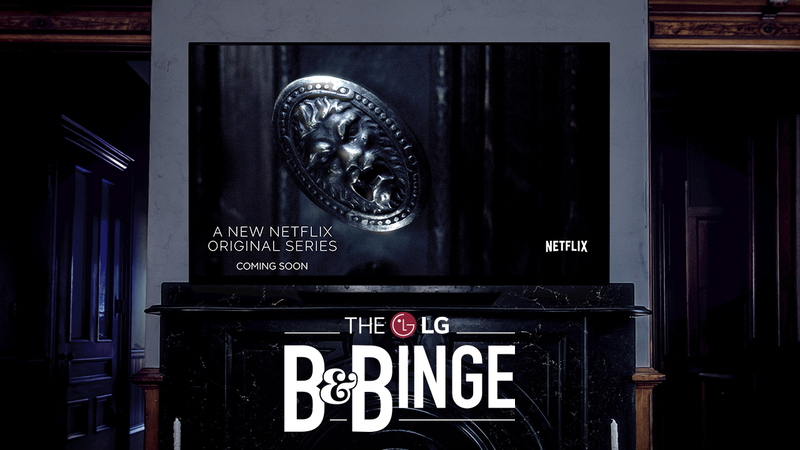 To enter this unique contest, go to LGUSA.com/LGBinge and explain what makes you the ultimate fan and why you deserve to win the LG ‘B&Binge’ viewing experience for your favorite show. ● Arrested Development Experience: The entry period begins at 9:00 a.m. ET on July 16 and ends at 11:59 p.m. ET on Aug. 12. Winners will be announced on or around Aug. 24. ● The Crown Experience: The entry period begins at 9:00 a.m. ET on July 16 and ends at 11:59 p.m. ET on Aug. 26. Winners will be announced on or around Sept. 7. ● Mystery Experience: The entry period begins at 9:00 a.m. ET on July 16 and ends at 11:59 p.m. ET on Sept. 27. Winners will be announced on or around Oct. 12. As the OLED TV pioneer, LG offers the industry’s widest OLED TV selection with 10 critically-acclaimed, category-leading 4K UHD models featuring proprietary LG OLED technology, which delivers perfect black levels, infinite contrast and over one billion rich colors, bringing images to life like never before. LG OLED TVs (and the renowned LG SUPER UHD TVs) come equipped with LG’s advanced ThinQ AI and third-party AI capabilities for enhanced connectivity and convenience, as well as advanced new processors that sharpen details and imagery. For more information about the LG ‘B&Binge’ contest, please visit: LGUSA.com/LGBinge. To learn more about LG’s award-winning lineup of LG OLED and LG SUPER UHD TVs, please visit us HERE.